The hand of a stranger offered in solace. A flower placed on a dead body as a mark of respect. A gentle word in response to fear and anger. It is these moments of empathy, in the extremis of human experience, which define us as people. 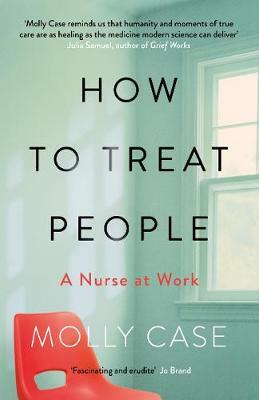 Nobody knows this better than a nurse and Molly Case has witnessed countless such moments. In How to Treat People, she documents these extraordinary points, when two people truly connect. In rich, lyrical prose, she introduces us to patients with whom we share the pain, but also the experience of illness when life is at its most vivid. And when her father is admitted to the high dependency unit on which she works, Molly confronts care in a whole new way, when two worlds - the professional and the personal - suddenly collide. Weaving together medical history, art, memoir and science, How to Treat People beautifully illustrates the intricacies of the human condition and the oscillating rhythms of life and death. Most of all, it is a heart-stopping reminder that we can all find meaning in being part, even for a moment, of the lives of others. Molly Case is a spoken word artist, writer and nurse born and brought up in south London. She received a First-class degree in Creative Writing and English Literature from Bath Spa University and during this time spent two years as a care worker looking after people with dementia. Upon leaving Bath, Molly decided to pursue a career in nursing and is currently working at St George's Hospital, London as a cardiac nurse specialist. In April 2013 she achieved national recognition after performing her poem 'Nursing the Nation' at the Royal College of Nursing. The performance has now been viewed over 400,000 times. Her debut collection of poetry, Underneath the Roses Where I Remembered Everything was published in 2015. Molly has appeared in the Guardian, the Independent, the Times, Elle magazine and Huffington Post, and was named in the Health Service Journal's Inspirational Women list and the BBC's 100 Women list.